Karl Gibbs (blue) is a big presence in the Peterborough Sports Reserve side. Peterborough Sports Reserves’ manager Andrew Bradley admits an aggregate winning margin of 28-0 in the last three competitive matches is not ideal preparation for a clash of Peterborough Premier Division titans tomorrow (October 1). But Bradley is confident his experienced side will take the huge step up in class in their stride when they visit the home of unbeaten leaders, and reigning champions, Moulton Harrox (2pm kick-off). Peterborough Sports Reserve team boss Andrew Bradley. Sports warmed up for the big game with an 8-0 win at bottom club Thorney. They also beat the same opponents in the President’s Shield 7-0 a week after thrashing Uppingham 13-0 in a top-flight match. “To be honest we should have scored more goals against Thorney,” Bradley insisted. “We missed an awful lot of chances. “The last three matches have not been a lot of fun in some respects and they’ve not been ideal preparation for a tough game at Moulton Harrox, but I have a very experienced squad this season and I am confident they will perform well in the bigger games. 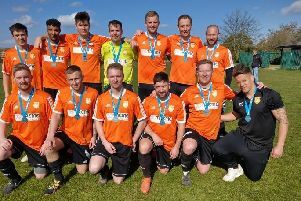 Carl Bird (2), Rikki Goodale (2), Gerard Evans, Liam Merryweather, Gary Gibbs and Karl Gibbs scored the Sports’ goals last weekend. Goodale and Bird are two of the summer recruits while Karl Gibbs’ demotion from the all-conquering first-team squad means the reserves have some serious firepower. Moulton had to come from behind to beat Deeping Rangers 2-1 last weekend. They are seven points ahead of fifth-placed Sports, but the city side have two games in hand. AFC Stanground are the surprise Premier Division package this season. They are up to third - Netherton United are second - after a 2-0 win at Uppingham secured by goals from Chris Brown and Dan Stephens. Netherton are at improving Crowland tomorrow, when Stanground hist Leverintron. Wisbech Town Res v Deeping Rangers Res.